I am so excited about today’s post! I’ve been keeping it a secret since before Christmas and I’m so happy to finally be able to share it with you! If you are a regular reader, you may know that my hubby and I are working a little at a time to update our 50 year old home. Although our home was by no means an “official” fixer-upper when we bought it, it has needed some updating to bring it out of the 1960’s. 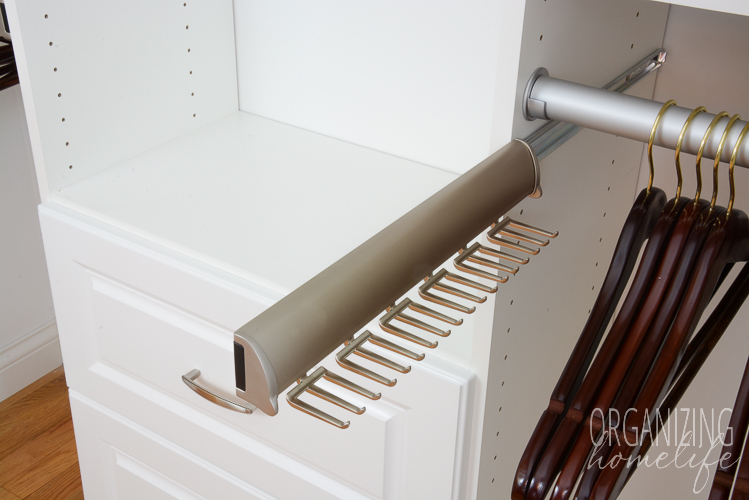 All the closets in the house had a single rod with a single or double shelf across the top. 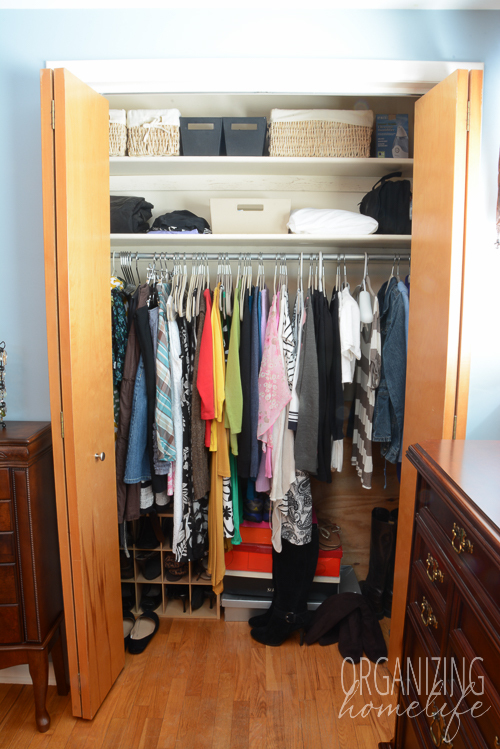 Here’s what the closets in the master bedroom looked like. Yikes. Not very dreamy for an organization lover. As you can see, the shoe situation in my hubby’s closet was not much of a problem. He’s not a man of many shoes. Dress shirts however? C.r.o.w.d.e.d! I stopped ironing his shirts after they were laundered because they get so squished and wrinkled in his closet. Unfortunately, that added stress in the morning when he was getting ready for work because he had to iron his shirts every day. Yes, he irons. Does he like it? NO. The top shelves in his closet became stuff collectors. Since almost everything he keeps in his closet hangs, the shelves were pretty useless. I put baskets in the top to hold extra sheets, but we never used them, so it was time to do some purging! My closet, besides being crowded with all the clothes on a single rod, had a major problem with shoes. 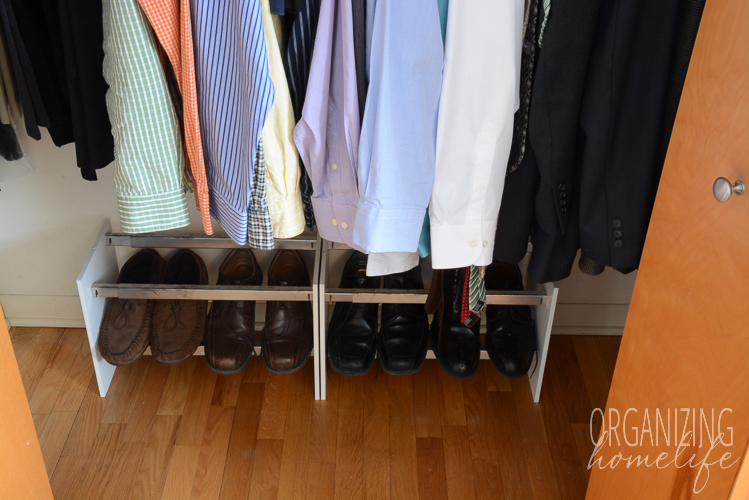 I had a divided shoe organizer shoved into the bottom corner, but it was not easy to access behind the clothes. I saved my boot boxes to store them during the warmer weather months so they didn’t get dusty, but I seriously hated having those bulky boxes on the floor of my closet. I used baskets and bins to help organize the top shelves a bit, but let’s face it: these closets needed a lot of help! 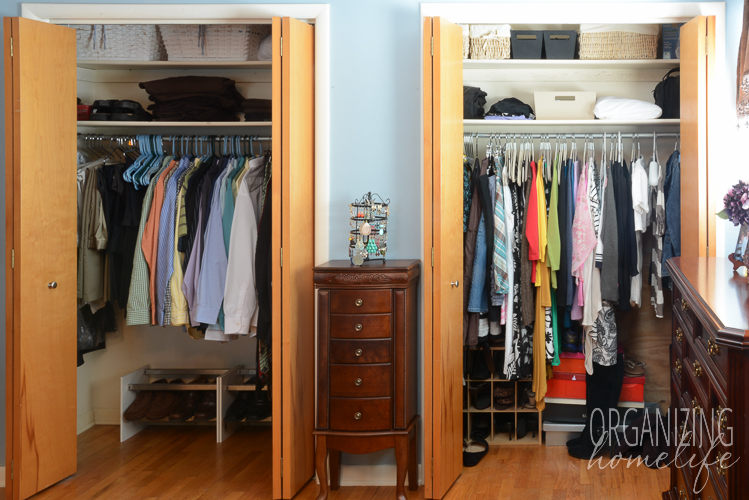 You may remember last year when I did an EasyClosets makeover in my girls’ room. The closet has been perfect for them, and it still looks just like the “after” pictures I showed last year. Check back tomorrow for the reveal and a BIG annoucement! Don’t miss it! That being said – I can’t wait to see what the big surprise is tomorrow! 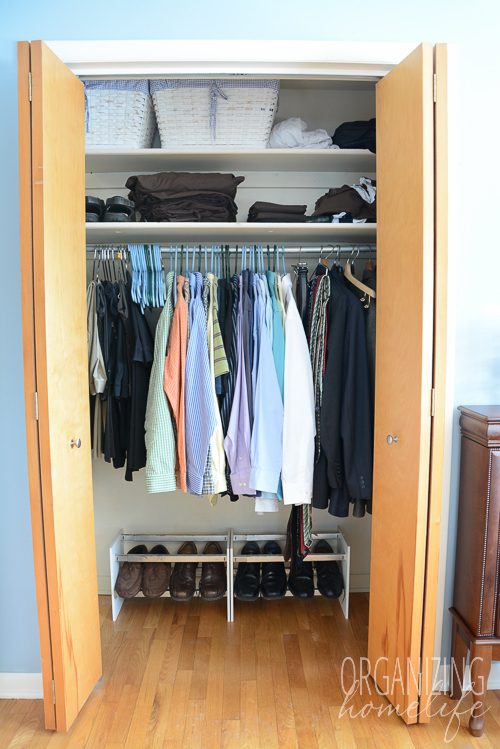 We have the exact closets in our master bedroom! Cant wait to see the reveal tomorrow! 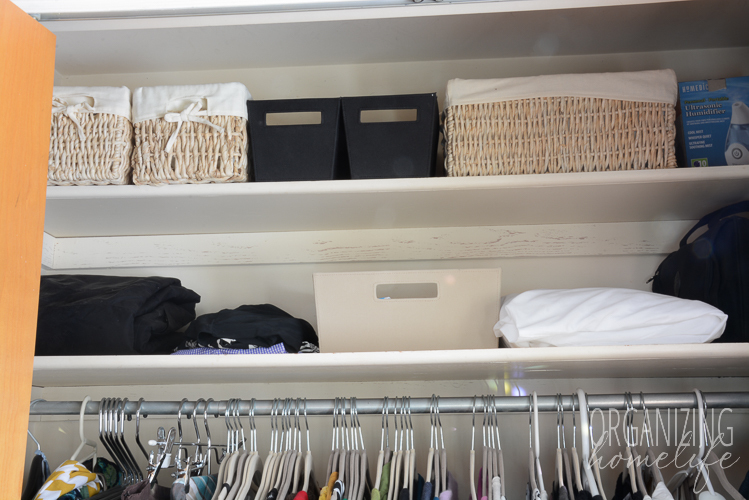 I would most likely organize the master bedroom closet. I need help with a lot of organization. This is a great giveaway. Thanks. My closet is so full, I can’t get the doors shut. 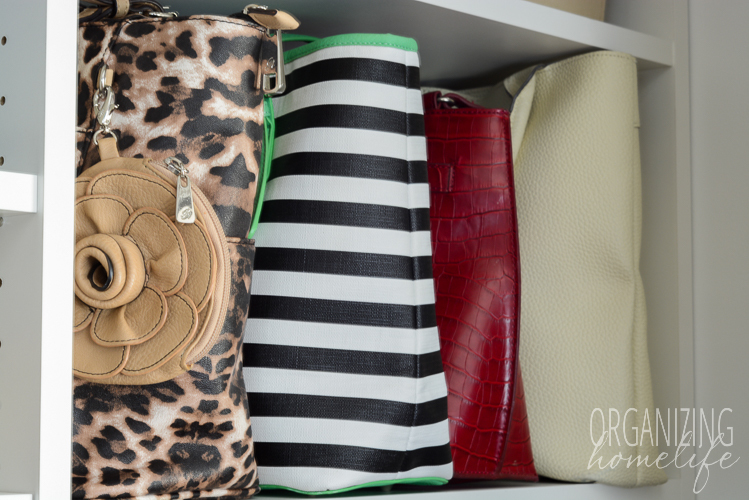 I’d love to win a closet organization set.